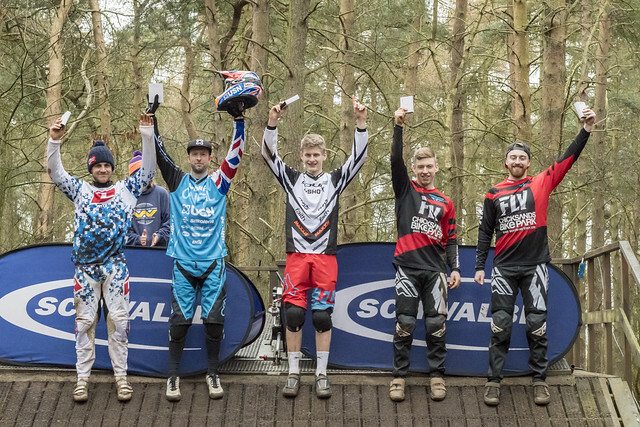 Aaron Dalleywater and Meg Wherry stormed to victory in the opening round of the HSBC UK | National Four Cross Series at Chicksands Bike Park. In perfect conditions, the season got off to a bang – with Dalleywater just holding off defending champion Scott Beaumont in a thrilling final in the men’s race with Connor Hudson in third. And in the women’s race, Wherry held off a strong charge from Heather Kay to take victory as she began the campaign in ominous form. Dalleywater got off to a fine start at the Bedfordshire course, taking his opening two heats to progress to the final. He was joined by defending champion Beaumont, who did not enjoy a straightforward day as he won only his first race and was second in the next two. All set up here at Chicksands for Round 1 of @schwalbetyresuk @british4x Series. Dalleywater kept his head despite unclipping his foot on the run up to the finishing line, but he managed to push it back in and power to the line first. “I knew they all had strong starts and I was the worst one there but I managed to hang back, find a gap and get through – so I am quite happy,” he said. “I knew Scott was right behind me so I had to use some defensive lines so I am very happy. Down that straight to the finish line and I unclipped so I thought that was it. Hudson finished third despite storming through the heats. The 2017 runner-up looked in fine form but could not find a way past Dalleywater or Beaumont after a tussle with Grant Hill at the start. In the women’s race, Wherry was taking no prisoners and from the opening heat she proved to be the strongest rider. She controlled each race from the start as the course played to her strengths, holding off Kay – who challenged in every race. Courtney Abbiss took third, edging out Hannah Escott. Tom Bell was the dominant rider throughout the junior race, leading each race from start to finish as he held off Ted Dalleywater in the final. Andrew Cross finished third, while Fin Keogh was fourth ahead of B final winner Alex Gray.